Are you running a mosquito maternity ward on your property? You'll probably say, “Of course not!” But the truth is that many of you are helping these blood-sucking pests multiply. You're doing it, perhaps unknowingly, by maintaining sources of standing water at your home, business or undeveloped land. There have been reports of above average numbers of mosquitoes in some areas. You may not be experiencing this in your backyard, but some of your neighbors are and I'm here to tell you that Camano Island’s overall mosquito problem is real, and residents need to play a role in addressing it. Did you know that 2012 was the second-worst year for human cases of West Nile virus disease in the United States since it was first documented in this country? There were 5,674 human cases reported to the Centers for Disease Control and Prevention. Many common mosquito species lay their eggs just above the water line on the inside surfaces of items that hold water, such as flower pots, metal cans, tree hollows and old tires. It only takes a few tablespoons of water and about one week of time for those eggs to develop into adult mosquitoes ready to fan out across the neighborhood and start the cycle again. I’m asking everyone to do their part to help control the mosquitoes. 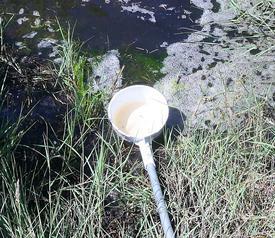 * Know your property – identify the places where standing water collects. * Eliminate water-collection sources when possible – Small items such as unused flower pots and old pet food bowls, can be discarded or stored in a dry place. Large items such as children's outdoor play structures can sometimes be modified by drilling or punching holes to let water drain out. * Empty water once a week – For items meant to hold water, such as birdbaths and wading pools, empty and replace the water every seven days to reduce the odds of mosquitoes breeding successfully there. *Call your Camano Island Mosquito Control District. I’ll come to your property and do a site survey. You already pay for the service, remember I don’t know you have a problem unless you contact me. Do it for yourself, do it for your family, do it for your neighborhood – take a stand against standing water and help reduce Camano Island’s mosquito populations. 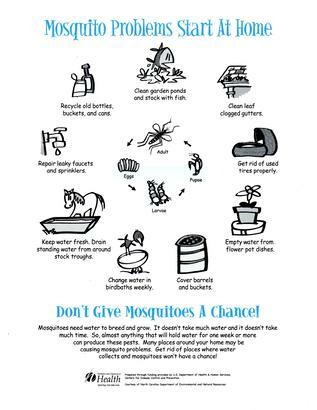 Don't give mosquitoes a home! Mapping: Surveillance data, breeding sites, population trends, control measures implemented. Control Strategies: Habitat modification, Native predators and fish, EPA approved larvicides. Surveillance: Collection and identification of mosquitoes. Contrary to popular belief spraying / fogging for adult mosquitoes (adulticiding) is not the first step in an Integrated Mosquito Management plan. Spraying or fogging is an expensive undertaking and usually requires very large areas to be treated, where as when you control the mosquito larvae at the source the mosquitoes are concentrated in smaller areas. Larviciding uses much less product over a smaller area than adult spraying thus saving money, resources, and there is less of an environmental impact. The Camano Island Mosquito Control District has not done any adulticiding. The Camano Island Mosquito Control Districts participates in the Washington State Department of Health West Nile Virus surveillance program. *The Camano Island Mosquito Control District utilizes an Integrated Mosquito Management strategy in which we determine the best control methods to abate mosquitoes and breeding areas. This may include habitat alterations, environmentally safe larvicide, and it may be that no control measures are needed.